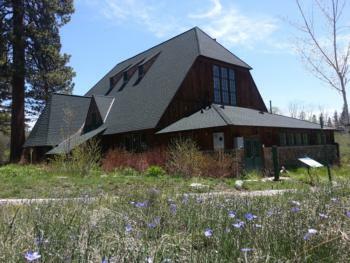 The Tahoe City Demonstration Garden and Historic Fish Hatchery building and Eriksson Education Center are located at 2400 Lake Forest Rd. The Education Center and Demonstration Garden are operated by the UC Davis Tahoe Environmental Research Center (TERC) and open to the public from Memorial Day through Labor Day seven days a week, 8am-6pm, for self-guided tours. Docent-led tours through our historic hatchery building and demonstration garden are available on Saturdays from 10am-2pm. The 3-acre garden focuses on encouraging native plant gardening, implementing various Best Management Practices (BMPs), and utilizing citizen science to monitor a plant’s response to changes in climate. Follow the permeable path that meanders through the garden and learn about Tahoe’s native flora by reading the small green identification signs that are sprinkled throughout the garden. Using a diverse array of native species of different sizes and textures in your gardening plan will not only reduce your dependency on water and fertilizers, but it will also help maintain the health of the ecosystem by attracting native wildlife and pollinators. Learn what types of bright, fragrant flowers to plant in order to attract bees and butterflies. Discover which shrubs provide food sources and habitat for local birds. 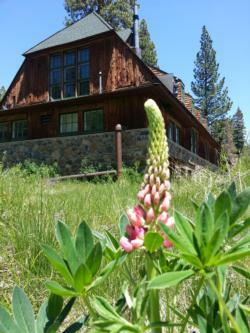 Tahoe Basin’s native plants thrive in the short growing season, variable climate and acidic, hydrophobic soil conditions. By planting native plants you are creating a low-maintenance garden that will efficiently cycle nutrients, minimize and prevent erosion, and conserve important resources. Among the small green plant identification signs throughout the garden you will also see larger blue signs that display different types of BMPs implemented in the garden. Whether it’s stabilizing a slope for erosion control or thinning your trees and removing high fuel shrubs to create defensible space, there are many ideas that you can implement to allow your garden to mimic the functions of a natural landscape. Human impact on the environment has caused significant changes to the Tahoe environment. In the last 50 years Tahoe has lost over 30 feet of clarity due to microscopic particles that remain suspended in the water. Your garden can help mitigate this change and trap these problem-causing particles through BMPs. Phenology is the study of seasonal changes or phases of plants from year to year, such as growth, flowering, and fruiting. The timing of plant growth directly affects the rest of the ecosystem including insects and migratory birds. These changes have a direct relationship with weather and climate. Plants are stationary and cannot move away from a threatening factor, therefore their responses to climate can help us predict an increase or decrease in population, making phenology one of the best indicators of climate change impacts. Become a citizen scientist at the Tahoe City Demonstration garden by collecting phenology and water quality data that can be utilized by scientists around the world. You don’t need to be a scientist to be a citizen scientist; all you need is enthusiasm to learn and a passion for preserving your beautiful environment. 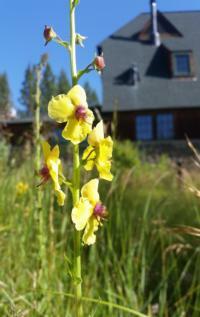 Help us collect phenology data by joining TERC docents on Saturdays from Memorial Day through Labor Day (10am-2pm). TERC is a leader in research on the water quality, physical processes and ecology of Lake Tahoe and its watershed. Our research and data are used to support policy decisions in the area and to aid research efforts at other lakes around the world. To learn more, visit the UC Davis TERC website or visit our Tahoe Science Center in Incline Village (open year round)!